I’ve been very fortunate to be part of some great sales and marketing organizations over the years. No question, these companies have taught me a ton of things that I wish that I had known when I was 22 and first starting out my career. This blog isn’t so much about personal life lessons as it is about a career in sales. In this blog, I’d like to share what I’ve learned both in my own career and by starting several companies that provided crucial on-the-job experience. a) The role of sales has become more important than ever, especially in B2B sales – the U.S. Bureau of Labor Statistics shows that one out of every nine American workers are in sales. This is the same number as 10 years ago – even with the Internet resources now available to buyers. b) Sales roles are becoming that of sales advisors – While an initial negative impression of sales may drive buyers online, this perception is changing as sales professionals begin to better engage and advise buyers, making it easier to buy from them. Simply put: A buyer’s negative first impression of sales people can quickly be changed by a sales advisor who influences through insight throughout the buyer’s journey. Further, without going down the road of debating sales as an art vs a science, I will say the shift in power to the buyer has caused the sales profession to be far more of a science than it is an art. On truth that remains, information has always been power and today’s buyer may actually have more information on what you sell than you do. If you aren’t passionate about sales as a profession that requires discipline, then you should get ready for mixed results and some lean years ahead. From a company perspective, I’ve helped build out sales for several organizations and informally studied the behavior of those in sales, as well as how organizations enable sales success. What I’ve learned is that sales reps who exceed their quota, year after year, regardless of the product they sell or the economic climate, typically take a disciplined approach. 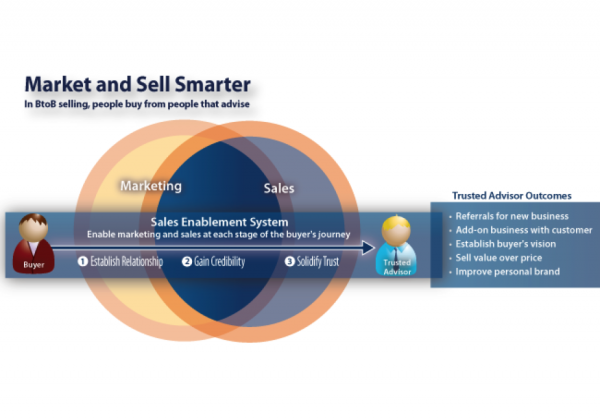 They have either developed a system to drive their success or used a hybrid approach that leverages the selling system provided by the organization combined with their own. Why do I promote a disciplined approach for the sales rep and organization? I’ve learned that organizations that take a systemized approach for activities, such as on-boarding new staff, launching new products, understanding the buyer experience, and sharing sales best practices, are far more likely to produce predictable revenue growth. Having been on more sales calls that I care to remember and deployed selling systems (aka sales enablement platform) at more than 100 companies provides me with a unique vantage point for this discussion. Best Practice: The next time you interview for a sales position, ask a simple but important question: what is in place to enable sales success? Proof of enablement initiatives serves as an indication of the company’s commitment to your success as well as that of the buyer. In some of the best organizations that I’ve been part of, both the organization and individual takes ownership on sharpening these skills daily. Best practice: to demonstrate your skills, once you have refined your organization’s pitch to align to an industry, role, or other specific criteria, consider publishing it to your profile, related LinkedIn Group Discussions, SlideShare, Twitter and other social sites to build awareness for targeted value your company delivers. Early in my career, I decided to leave a stable Fortune 500 firm to join a small emerging software vendor, planning to spend a couple years on the road to learn how different types of companies did business. 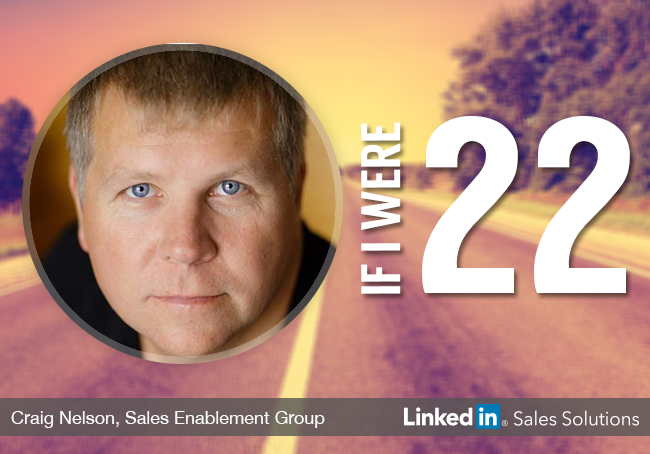 Twenty years later, I’m still “on the road” focused on helping build companies and drive sales success. I’ve found my passion in selling and enabling sales success with a disciplined approach, commonly known as sales enablement. One of the benefits of working for startups is the opportunity to perform many different roles. Typically, titles mean very little in a startup. In this type of organization, you do whatever it takes and you think more about how to drive revenue growth and, in turn, survive. From a life standpoint, working with many different people and companies provided far more than I ever expected. It’s great to work with clients who are proud of their company, their town, their favorite sports team, etc. Taking an interest in your client’s success will professionally lead to more interesting and deeper relationships while creating memories that keeps your passion alive. If I were 22 and getting started, here are Five Tips that could have helped me for selling in today’s B-to-B environment, especially when it comes to selling to today’s empowered and confused buyer. Understand the buying experience from the buyer’s perspective. Work closely with product management, marketing, and sales to understand how to deliver the right value proposition using “content components” that can be easily repurposed to reach discrete types of buyers. This becomes much easier and productive as the lines between your internal departments fade. Perform your own drip marketing campaigns to your network and social sites daily. Convey your customer’s business outcomes to gain the attention of new buyers. The time spent performing these activities will align well with the “land and expand or prove it” approach that buyer’s control as shown in this diagram. I would suggest that the above is in priority order, as people still first buy from people. This has not changed over the years. One resource to help you better understand today’s sellers and buyers is Daniel Pink’s book, To Sell is Human. I would agree with his statement that sales has changed more in the past 10 years than it has in the last 100 years. Factors, such as the importance of the buyer’s experience, mobile technology, real-time enablement, and other transformational aspects of sales, is critical to your success in both the short- and long-term. One technique that has received a lot of attention of late is the use of whiteboard discussions, what we use to call “solution chalk-talks.” Over the years, this is something many top sellers have leveraged to gain an advantage over those pitching products with a standard PowerPoint presentation. If possible, go to the whiteboard on every in-person sales call and adapt your story on the fly to your buyer’s needs. 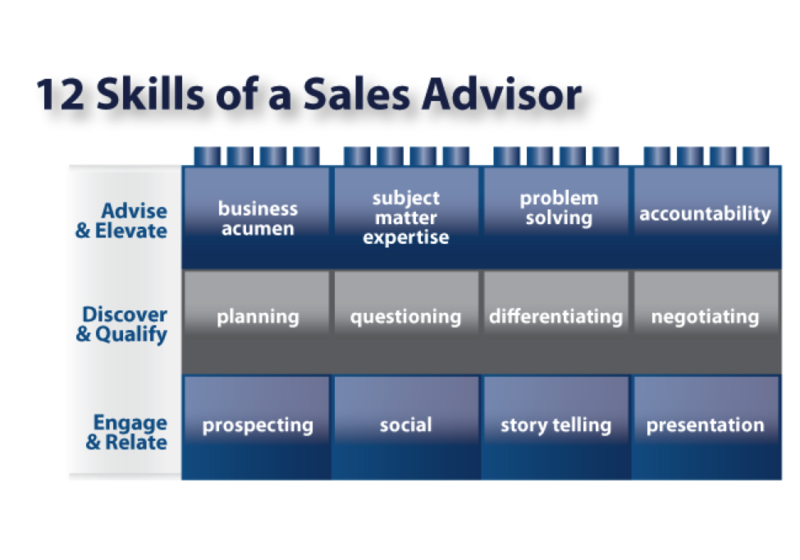 This is a quick way to convey your skills and understand the buyer before taking time to discuss or show the product. Best practice: Prior to the sales call, ask the buyer if the meeting room has a whiteboard for performing a needs gathering chalk-talk. This allows you to set their expectation that you will focus what you offer based on their discrete needs for a better use of their time. In other words, you need to sell using time for the solution chalk-talk vs a product only pitch. Before the call, you should test your ability to deliver based on the buyer’s industry/role to see if your value proposition fits and is compelling. A classic question by the sales rep at the end of the sales meeting is “how did we do today?” With the solution chalk-talk approach, you will know minutes into the meeting if you are on track, allowing you to continue or change direction. And, if the buyer takes a picture of the whiteboard at the end of the chalk-talk discussion, you will know it was successful. Also, the sales team benefits when the debrief session becomes a constructive discussion on how to advance the deal or possibly walk away from the business. In my opinion, making the chalk-talk part of your routine is an essential part of becoming a sales advisor. Best practice: Check your brand on your LinkedIn profile today. Does it convey the value you bring to the buyer or does it simply promote your achievements? Is part of your routine using tools like Newsle and LinkedIn Saved Search to understand market shifts and changes within your network? Are you contributing content to LinkedIn Group Discussions and other thought leadership discussions? This type of activity will get you earlier in the buying process – all while promoting the value you bring based on your customer’s success and your insight. Find your passion, learn from others who share your passion, and build deeper relationships with customers who have a passion in building a successful business by leveraging what you sell.